Production: Metro-Goldwyn-Mayer Picture Corp.; black and white, 35mm; running time: 96 minutes. Released 1935. Filmed in MGM studios. Producer: Irving Thalberg; screenplay: George S. Kaufman and Morrie Ryskind, uncredited assistance by Bert Kalmar and Harry Ruby, with gagwriter Al Boasberg, from a screen story by James Kevin McGuiness; photography: Merritt B. Gerstad; editor: William Levanway; sound recording director: Douglas Shearer; art director: Cedric Gibbons; music score: Herbert Stothart; costume designer: Dolly Tree; dances: Chester Hale. Mackand George Irving ( Committee ); George Guhl ( Policeman ); Harry Tyler ( Sign painter ); Phillip Smalley and Selmer Jackson ( Committee ); Alan Bridge ( Immigration inspector ); Harry Allen ( Doorman ); Lorraine Bridges ( Louisa ). Kaufman, George S., and Morrie Ryskind, A Night at the Opera , New York, 1972. Treadwell, Bill, 50 Years of American Comedy , New York, 1951. Crichton, Kyle, The Marx Brothers , New York, 1951. Marx, Arthur, Groucho , New York, 1954. Cahn, William, The Laugh Makers , New York, 1957. Eyles, Allen, The Marx Brothers: Their World of Comedy , New York, 1966. Zimmerman, Paul D., and Burt Goldblatt, The Marx Brothers and the Movies , New York, 1968. Thomas, Bob, Thalberg: Life and Legend , New York, 1969. Anobile, Richard, editor, Why a Duck? Visual and Verbal Gems from the Marx Brothers Movies , New York, 1971. Boyum, Joy Gould, and Adrienne Scott, Film as Film: Critical Responses to Film Art , Boston, 1971. Joseph Adamson, Groucho, Harpo, Chico, and Sometimes Zeppo: A History of the Marx Brothers and a Satire on the Rest of the World , New York, 1973. Mast, Gerald, The Comic Mind: Comedy and the Movies , New York, 1973; revised edition, Chicago, 1979. Marx, Samuel, Mayer and Thalberg , London, 1976. Chandler, Charlotte, Hello, I Must Be Going: Groucho and His Friends , New York, 1978. Arce, Hector, Groucho , New York, 1979. Gehring, Wes D., The Marx Brothers: A Bio-Bibliography , Westport, 1987. Marx, Groucho, The Marx Brothers Scrapbook , New York, 1989. Bergan, Ronald, Marx Brothers , Edison, 1992. Eyles, Allen, The Complete Films of the Marx Brothers , Secaucus, 1992. Stables, Kate, Marx Brothers , New York, 1992. Mitchell, Glenn, The Marx Brothers Encyclopedia , North Pomfret, 1996. Sennwald, Andre, in New York Times , 7 December 1935. Variety (New York), 11 December 1935. New Yorker , 14 December 1935. "Sam Wood," in Current Biography Yearbook , New York, 1944. Rowland, Richard, in Hollywood Quarterly , April 1947. Eyles, Allen, in Films and Filming (London), February 1965. Denton, Clive, "Sam Wood," in The Hollywood Professionals 2 , New York, 1974. Prouty, Howard H., in Magill's Survey of Cinema 3 , Englewood Cliffs, New Jersey, 1980. Vega, J., in Contracampo (Madrid), October 1981. Urban, M., in Filmkultura (Budapest), May 1985. Hemming, Roy, "LV Classics: Singin' in the Rain/A Night at the Opera," in Video Review (New York), vol. 9, no. 11, February 1989. Arnold, Gordon B., "From Big Screen to Small Screen: A Night at the Opera Directed by Sam Wood and Starring the Marx Brothers," in Library Journal (New York), vol. 114, no. 9, 15 May 1989. Catsos, G. J. M., "Allan Jones Remembers: Night and Day with the Marx Bros.," in Filmfax (Evanston, Illinois), February-March 1991.
" A Night at the Opera ," in Premiere (New York), vol. 10, November 1996. A Night at the Opera is the sixth Marx Brothers movie and their first with MGM Studios. Duck Soup (1933) had been a critical and commercial failure, and marked the end of the Marx Brothers' contract with Paramount. Zeppo Marx had left the team, and for a time it appeared that the brothers' movie career was at an end. However, producer Irving Thalberg became interested in them, and an MGM contract was negotiated. It was Thalberg's contention that the audience for Marx Brothers movies could be broadened by bringing the story line, characterizations, musical numbers, and production values up to the high standard already set by their comedy sequences; that is, by putting the Marx Brothers into a musical comedy, rather than surrounding a collection of their vaudeville-style routines with a sketch intended only to glue them together. The Marx Brothers, who had attempted something similar on Broadway without finding an appropriate property, agreed with him, and an excellent working relationship was established. 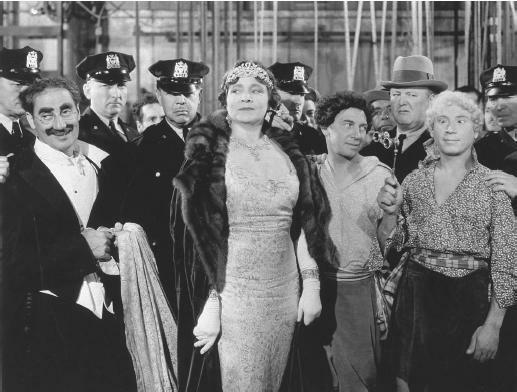 The script of A Night at the Opera provides sympathetic, integrated characters for all of the Marx Brothers, and the operatic and shipboard settings make an appropriate contrast to the team's anarchic comedy style and offer opportunities for good roles for regular Marx Brothers supporting players Margaret Dumont and Sig Rumann. Final credit for the screenplay went to George S. Kaufman and Morrie Ryskind, but the concept was apparently also treated earlier by Bert Kalmar and Harry Ruby, and received significant additions from gagwriter Al Boasberg. Zeppo was replaced as romantic lead by Allan Jones, a convincing actor and excellent singer who, with ingenue Kitty Carlisle, managed to supply both a believable love story and strong musical numbers. Thalberg also suggested trying out the comedy numbers on the road for audiences, a system that the team continued to use in later productions. The Marx Brothers, with part of the rest of the cast, took a tabloid version of the show on a short tour of four western cities, accompanied by writers Ryskind and Boasberg (Kaufman, who disliked Hollywood, had returned to New York). Audience reactions were monitored and scenes rewritten for maximum effect. Filming included not only the perfected routines, but also reaction time for laughs, which had been timed by stop-watch during live performances. It appears that the completed film owes little to director Sam Wood; the concept was Thalberg's, and the execution was chiefly by the writers and the Marx Brothers themselves. The resulting film was the Marx Brothers' most successful with both critics and the public. It contains some of the team's best comedy routines, including the famous stateroom scene; the contract scene, in which Groucho and Chico edit a legal document by simply tearing off the offending clauses; and a spectacular finale in which the three Marx Brothers demolish a full-scale production of Il Trovatore . However, it also has straight musical numbers which became hit songs outside the film; logical places in the plot for Harpo's and Chico's musical specialties; and an overall polish and integrity which had not been present in their earlier movies. Its success prompted the team to apply the same formula to most of their subsequent films, but only A Day at the Races comes close to matching its quality. Thalberg died during the making of A Day at the Races , and no other producer was willing to invest the same resources in a Marx Brothers comedy. Recent critical opinion allows A Night at the Opera to retain status as one of the best, if not absolutely the best, of the Marx Brothers films. Duck Soup , despite its early failure, has become a favorite of those Marx Brothers audiences who feel that any interruption of comedy sequences is a waste of time, and of those who profess to see it as a powerful statement against war. However, A Night at the Opera is generally considered to equal Duck Soup in the perfection of its comedy routines and dialogue, and certainly to surpass it in the quality of the film as a whole.